The naval records contain a list of Esper’s postings, but some of this is a bit confusing. Most of those postings were to the Baltic area. However there is one posting in November 1877, when he was posted to the command of the Tsar’s brother, His Imperial highness the General Admiral Grand Duke Constantine Nikolaevich. This was during a war with the Ottoman Empire. The Ottoman Empire was in decline, it had already lost Romania and Serbia, now there had been a revolt in Bulgaria and they were fighting for freedom from the empire. Russia was anxious to help countries seeking such freedom, and thereby gain useful allies. However Russia’s naval strength in the Black Sea was woefully inadequate, Russia had been compelled to destroy their Black Sea fleet as part of the peace settlement after the Crimean war. A crisis had been started with an uprising in 1875 in Bosnia and Herzegovina. Bulgaria followed Bosnia’s example and started an uprising later in 1875 which failed. However they mounted a more successful uprising in 1876. Because the Ottoman army was heavily deployed attempting to suppress the Bosnian uprising they had to use irregular troops to suppress the Bulgarians. Those troops, Bashi-bazouks, largely comprising of Muslim people who had been expelled from Russia, used rather extreme methods to put down the uprising. There were many massacres. Some estimates that over 10,000 people were brutally killed. Stories of the events got back to Bulgarian students at Constantinople university and then to foreign diplomats and newspaper reporters. With increasing reports of the incidents in London, Disraeli’s government, which had a policy of supporting the Ottoman Empire against Russia, came under pressure from the opposition led by William Gladstone, to condemn the Ottoman Empire and called for Bulgaria to be given independence. In Russia there was an even stronger reaction, some saw an opportunity for a war to unite all Slavic people. In June 1876 Serbia then Montenegro declared war on the Ottoman Empire. They were assisted by Russian volunteers. They managed to keep the ottoman army out of Serbia, though failed in some of their main objectives. At this point Russia and Austria came to an agreement about the disposal of former parts of the Ottoman Empire. Austria would gain Bosnia and Herzegovina, Austria would support the return of Bessarabia (a country between Ukraine and Romania) to Russia as well as a port, Batumi, on the east coast of the Black Sea. Bulgaria was to become independent. There were various peace moves made by the great European powers, including a conference in December 1876 held in Constantinople, to which the Turks were not invited. The conference reached a compromise solution granting autonomy to Bulgaria, Bosnia and Herzegovina. The ottomans refused to allow international representatives to oversee various institutional reforms affecting religious minorities and eventually disregarded the conference. Then in 1877 Russia and Austria-Hungary signed an agreement which ensured that Austria-Hungary would be neutral in the coming war. Russia declared war in April 1877 and advanced through Romania to attack the Ottoman armies. While the Russians had a larger army, some 300,000 troops to the Ottomans 100,000, the Ottomans were in control of the Black Sea with 15 ironclad warships and 7 small river monitors patrolling the Danube. They also had superior weapons, supplied by America, Britain and Germany. Ref 1. The Russian navy was very deficient. After the defeat in the Crimean war the treaty of Paris in 1856 forced Russia to reduce their Black Sea fleet to 6 small warships. Though the Tsar had repudiated the treaty in 1871 Russia had no warships capable of going up against the Turkish navy. Ref 2. The Russians requisitioned 19 fast merchant steamers which were to be used as tenders for small steam launches. The launches were to be used either with spar torpedoes or towed torpedoes and ultimately self-powered torpedoes. This war marks the first use in war of the recently developed torpedo. Esper’s grandson, repeated a story he had been told about Esper in this war. He was put in charge of a small boat, it was implied that it was a row boat, which had a long pole jutting out from the prow to which a bomb had been attached. Then the boat would be steered toward the enemy vessel and every one would jump out at the last moment. When the bomb struck the vessel it would explode and sink the enemy ship. This seemed a very unlikely story. However the Russians did use spar torpedo boats, steam launches with a spar and a bomb stretching out from the bow. Many attacks were carried out in this way and in May 1877 such an attack was mounted against the Turkish river monitor Seyfi. 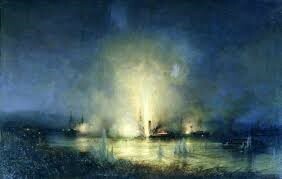 The Turkish ship was destroyed as portrayed in this painting by Alexey Petrovich Bogolyubov. No record has been found to confirm whether not Esper took part in such an attack, and from the dates in his record he was not in the area at the time of the attack on the Seyfi. However that method of attack was used frequently by the Russians and it is possible Esper took part in such an attack on another occasion. Figure 2 Spar Torpedo boat (Wikipedia). Esper’s naval record next places him back in the Baltic and for 10 days in May from the 6th to 16th of May 1878, he was on board the monitor “Bronenosets” in the Baltic Sea. There follows a series of assignments to various ships and roles until he was promoted to lieutenant in January 1881. There is a confusing series of postings listed in early 1881 which conflict to some degree with information from other sources. But 1881 starts a series of major events which not only transform the course of his life but set Russia on a path to revolution.